Oakland • Sept. 16, 2013 • Opportunities for self expression and creativity are essential to a good quality of life. A group of artists I met in Uganda recognized this and began sharing their skills and their paints and brushes with kids in the neighborhood. It was informal at first. The kids would show up at James Nsamba's tiny studio every morning, brimming with energy and curiosity. James and Farouk Mukwaya would hand out paper and paint and colored pencils...then give the kids some basic lessons in how to use art materials to express ideas and feelings. Gradually we got more organized. We call ourselves Uganda Art Consortium. We started a website, ugandart.com, and we're part of Kisa Foundation USA, a 501 (c) (3) charity. NWIC’s goal for the evening is to raise $250,000 in support of the college’s cultural arts and education and to enhance our relations and understanding within the region. Our vision for education at NWIC is based in deeply held beliefs about relationships and stewardship. Tickets are $250 for the TL'aneq' event. 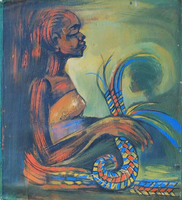 Over 100 works by members of Uganda Art Consortium will be on display May 8, 9 and 10 in the largest exhibit and sale of Ugandan art ever held in the U.S. The show is part of the Ballard May 2009 Artwalk. Works include oil paintings, wood block prints, vat dye paintings, silk screen prints and other media. Beadwork jewelry produced by children in UAC's free workshops for AIDS patients and orphans will also be on sale. Artists included in the show include Kizito Fred Kakinda, James Nsamba, Kennedy Baguma, Matias Tusime, Hassan Mikiibi, and Hadson Mbabazi. The exhibition will be held at the Ballard Bookcase Gallery, 4611 11th Ave. NW Seattle, WA 98107. For information about the show, contact Tom Herriman, 206-353-5978. Shoreline, WA -? The Northwest Junior Pipe Band placed first in a field of 7 pipe bands competing with a mix of traditional and modern pipe band tune compositions at the Tacoma Highland Games June 23rd. Northwest Junior Pipe Band is nearly 40 talented youth aged 7 to 18 learning dedication, focus, respect, perseverance, and commitment. NWJPB has announced their intention to compete at the World Pipe Band Championships in Scotland, 2008 and compete several times throughout the summer at area Highland Games events. Highland Games competitions are a cultural and music experience unlike any other. Lush - A bold, honest Scholastic Press debut from Natasha Friend.